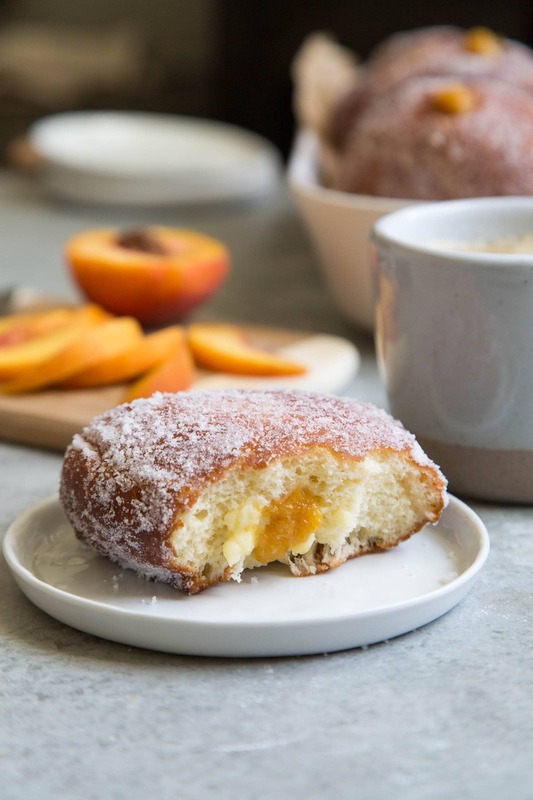 Homemade pastry cream and peach preserves are stuffed inside these peach cream filled doughnuts. A tasty way to celebrate the end of summer! Do you notice something different? YES. The Little Epicurean had a bit of a makeover. Thanks to Lindsay of Studio LMH my site has a brand new look. What do you guys think?! Naturally, I’m celebrating with something sweet. Ever since visiting General Porpoise in Seattle, I have become obsessed with filled doughnuts. I’ve been perfecting my filled doughnut recipe all summer and I’m finally ready to share it with you! These doughnuts take quite a bit of time and effort. I know the recipe instructions look overwhelming. There are a ton of steps and components. Break it down over the course of three days to make it easier and less intimidating. On day two, cook the pastry cream and mix the dough. The dough needs 6-12 hours of resting time in the fridge. I like to prepare the dough before bed and then letting the dough slowly proof in the fridge overnight. The following morning (day three), you can fry up the dough and assemble with ease. 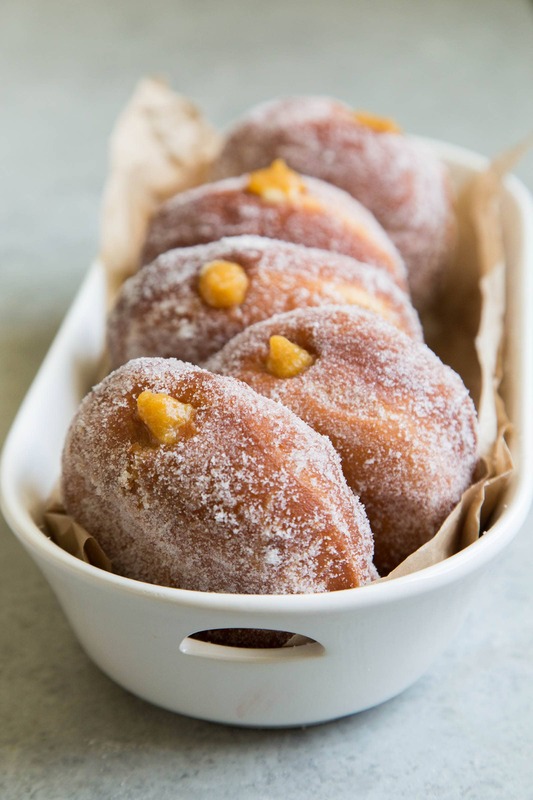 Start the preserves on Friday and enjoy homemade cream filled doughnuts all day on Sunday. To ensure that each doughnut has plenty of filling, I pipe pastry cream and peach preserves on two ends of the doughnut. There’s nothing more disappointing than a cream doughnut with very little filling. Don’t worry about overstuffing it. The doughnut isn’t filled until it feels heavy. Once the doughnuts are filled, they need to be consumed immediately. While two people can easily devour these (Alex and I speak from experience), it’s better to share the wealth. Gather your friends, family, and neighbors over. 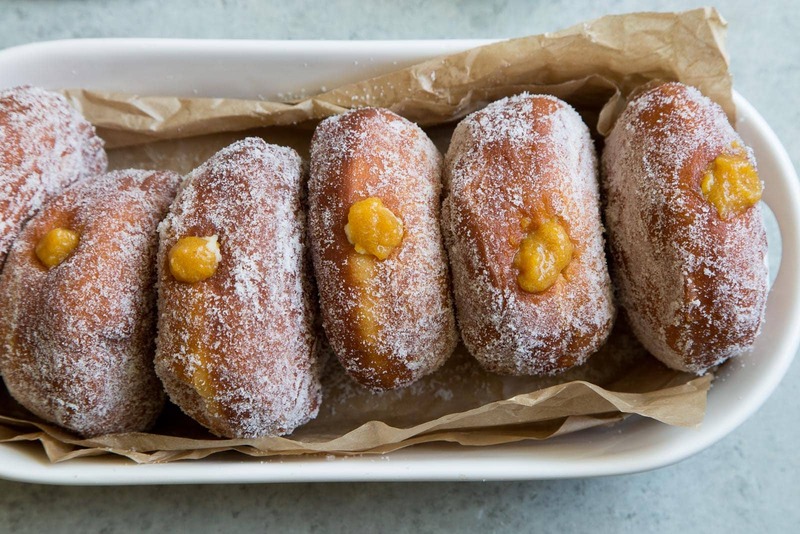 Cream filled doughnuts are best enjoyed within hours of filling. Over time, the pastry cream will start to separate and the doughnuts will become soft and soggy. 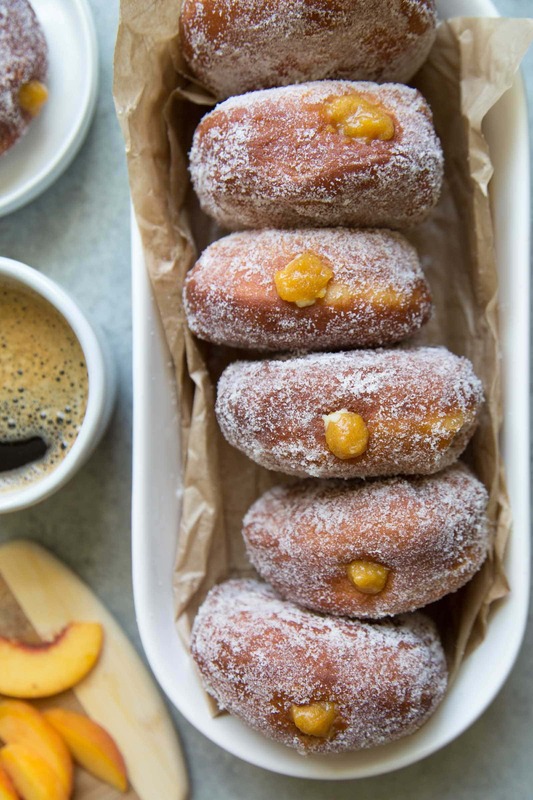 For a quick and easy filled doughnut recipe, try these coffee custard filled doughnuts. The dough only requires an hour of resting time. Combine peaches, sugar, salt, and lemon juice in a heavy bottomed sauce pot. Set over medium heat and bring to a boil. Lower heat and allow to simmer for 10-15 minutes until peaches are soft. Stir as necessary to prevent burning. Remove from heat and mash peaches using a muddler. Cool to room temperature. Transfer to a container and keep chilled in the fridge until ready to use. Line a quarter-sheet baking pan with plastic wrap, making sure the sides of the pan are also covered. Set aside. Pour 1 1/2 cups milk into a large heavy bottomed sauce pot. Add salt and 1/2 cup sugar. Whisk together. Place over medium-high heat. Stir occasionally to make sure the milk does not burn along the sides or bottom of the pan. Bring to a boil. Meanwhile, in a medium bowl, whisk together cornstarch and 1/4 cup sugar. Add in remaining 1/2 cup milk and yolks. Whisk until smooth. Once milk has boiled, reduce heat. Slowly add a little bit of the milk into the cornstarch mixture. Whisk constantly to distribute the heat. Continue to add milk and whisk until only a couple tablespoons of milk are left in the saucepan. Pour all the egg-milk mixture back into the saucepan. Whisk constantly over medium-low heat until the custard has thickened. Keep whisking and let the custard come to boil to cook out the cornstarch flavor. Remove from heat. Whisk in butter until smooth. Add vanilla and whisk until combined. Pour the hot pastry cream into the prepared plastic wrapped sheet pan. Spread evenly. Cover with plastic wrap and freeze for 10-15 minutes until the pastry cream has cooled to room temperature. Remove from freezer and transfer to an airtight container. Place plastic wrap directly on pastry cream to avoid condensation. Let chill in the refrigerator until ready to use. In the bowl of a stand mixer, dissolve yeast and 2 teaspoons of sugar in warm milk. Let sit for 5-8 minutes until mixture is foamy. Whisk in remaining sugar and eggs. 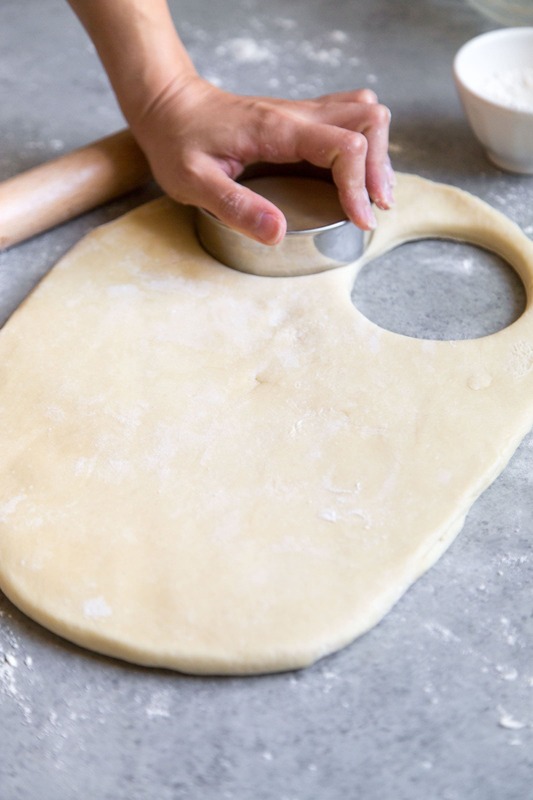 Attach dough hook to stand mixture. Add half of flour mixture and salt. Mix on low speed until dough begins to come together. Add remaining flour and continue to mix until dough is shaggy. Slowly add butter and increase speed to medium. Knead for 3 minutes until mixture forms a smooth dough. On a floured surface, roll dough to about 1/2-inch thick. Using a 3 1/2 or 4-inch round cutter, punch out doughnuts. Loosely cover rounds with plastic wrap. Let rest for 45-60 minutes until doughnuts are puffy. Add vegetable shortening to a large heavy bottomed saucepot (Dutch ovens and cast iron pans work best). Set over medium heat until oil reaches 350 degrees F.
Carefully place 2-3 doughnut rounds into hot oil. Do not overcrowd. Cook for 90 seconds to 2 minutes on each side, until golden brown. Use a slotted spoon to transfer cooked doughnuts onto a paper-towel lined baking sheet. NOTE: Oil temperature will change as you add raw doughnuts. Monitor oil temperature to make sure doughnuts do not burn. 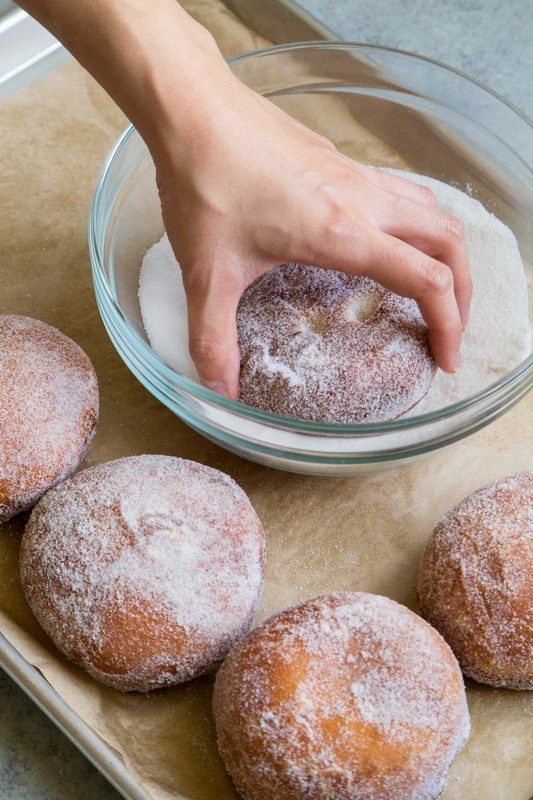 Toss warm doughnuts in sugar. Place on wire rack to cool until you are ready to fill doughnuts. Once doughnuts are completely cooled, use a chopstick to poke holes on each side of the doughnut. Prepare two pastry bags fitted with small round piping tips. Fill one bag with pastry cream, and the other bag with peach preserves. 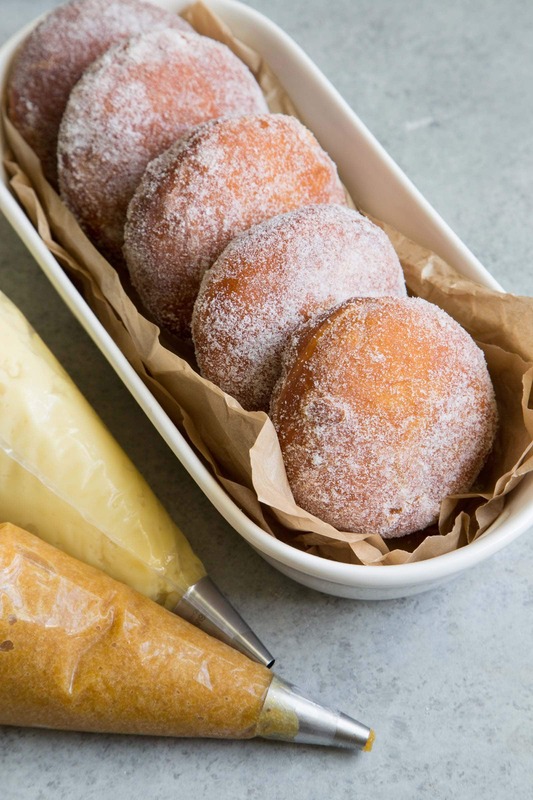 Squeeze about 1/4 cup of pastry cream into each doughnut, filling both sides. Squeeze about 1 Tbsp of peach preserves into each doughnut. Serve immediately. Regarding cooking times: sacrifice one doughnut as a tester to make sure the doughnuts are cooked inside. Adjust cooking times accordingly. I love the new site and these yummy doughnuts! It’s cute that you put that these would need to be consumed immediately because I’m pretty sure they’ll be gone almost instantly in my house, haha! These doughnuts look delicious!! I’ll be impatiently waiting for the pumpkin cheesecakes ones! These donuts are so pretty! I’m embarrassed to say I could eat so many of these! I love peaches and I love doughnuts! These look amazing! 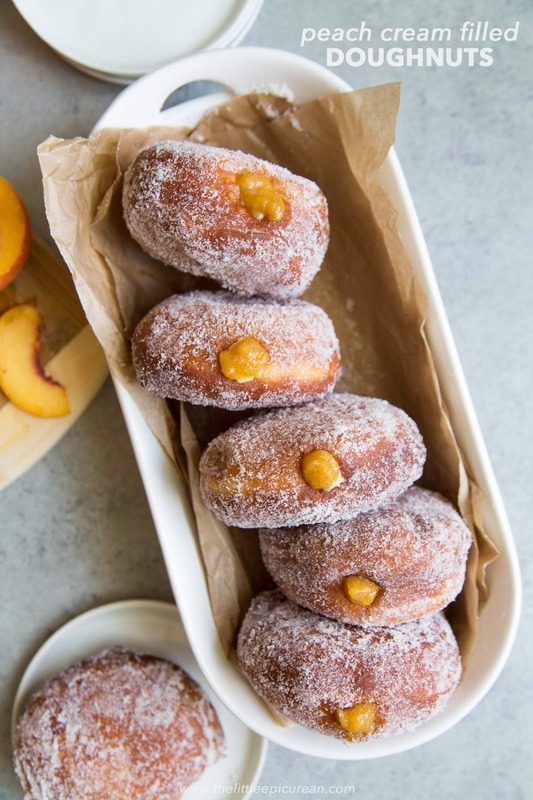 These filled doughnuts are so fabulous… love that peach filling! OMG! These doughnuts look heavenly! Need to try the peach cream filling! I am glad you are up for sharing! Because I am not sure I could start making something tonight and finish on Sunday:). My husband is the patient one in this respect.Thank you for devoting yourself to these over the summer, now I have a recipe to suggest to him:) I will wash all dishes. These are truly wicked!! Congrats on the site redesign- beautiful! And the new picture of you is so pretty! Thank you! Hope you have a great time in Seattle! There’s SO MUCH good food out there! I really didn’t know that you can prepare doughnuts at home so perfectly. Loved your recipe! Is it possible to use lime instead of lemon juice?